The default Rails error page is completely hideous and hurts to look at. Better Errors replaces the standard Rails error page with a much better and more useful error page. It is clearly more visually appealing, but it also provides much more detailed debug information (also the error page page is even responsive!). Better errors has an optional dependency to another gem. If you add the binding_of_caller gem to the gemfile then you could use Better Errors' advanced features (REPL, local/instance variable inspection, pretty stack frame names). Remember to add Better Errors gem inside a :development section. Do NOT run better_errors in production, or on Internet facing hosts. 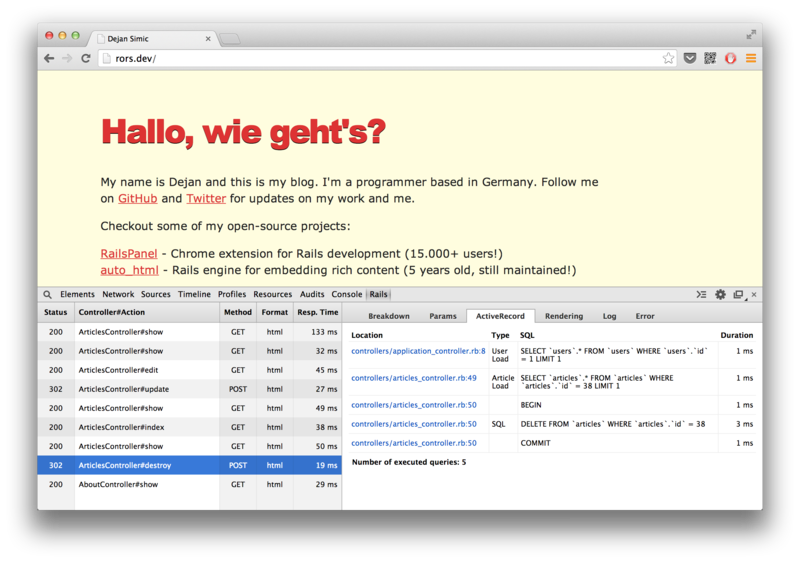 RailsPanel is a Chrome extension for Rails development that will end your tailing of development.log. Have all information about your Rails app requests in the browser - in the Developer Tools panel. Provides insight to db/rendering/total times, parameter list, rendered views and more. If you want to see both in action and learn a bit more about each of them, don't miss this RailsCasts!